The ARRL has announced plans to hold its National Centennial Convention in Hartford, Connecticut on July 17-20, 2014. The Convention will mark 100 years of the ARRL's founding in Hartford. ARRL President Kay Craigie, N3KN, has also announced a theme for ARRL's Centennial year: Advancing the Art and Science of Radio -- Since 1914. In May 1914, Hiram Percy Maxim, W1AW -- a leading inventor and industrialist in Hartford, Connecticut -- founded the American Radio Relay League, together with Clarence Tuska, 1WD, the secretary of The Radio Club of Hartford. Today, the ARRL serves almost 160,000 members, mostly licensed radio amateurs, in the US and around the world. The decision to hold the ARRL Centennial Convention in Hartford was made by the ARRL Board of Directors at its July 2012 meeting. The organization's headquarters has been maintained in the Hartford area since its founding. ARRL's present headquarters is located on Main Street in Newington, Connecticut, a suburb of Hartford, and is visited by nearly 2000 groups and individuals each year. The site has been home to The Hiram Percy Maxim Memorial Station, W1AW, since 1938. Read more here. The VoIP Hurricane Net -- running on the *WX_TALK* EchoLink conference node 7203/IRLP 9219 -- was active over a two day period from August 28-29 as Hurricane Isaac pounded the Northern Gulf Coast with high winds, extremely heavy rainfall, significant storm surge and river and stream flooding. The VoIP Hurricane Net operated for more than 25 hours continuously during the US coast landfall. Read more here. Have you ever wanted to go on a DXpedition, but lacked the time -- or resources -- to make it happen? Never fear, because you can go on four DXpeditions from the comfort of your armchair, thanks to the October edition of QST! In our annual DXing issue, discover DXpeditions of lore and legend as we take you to Malpelo, Rotuma, Navassa and the Mountains of the Moon. So sit back and enjoy all the fun and challenges that come with being in a remote part of the world, connected to civilization only by radio waves racing through the ether. 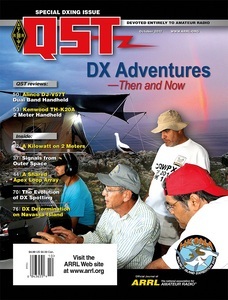 The cover of the October issue of QST features the 2012 HK0NA DXpedition to Malpelo, an island located about 235 miles of the coast of Colombia. In his article "Malpelo Island DXpedition 2012 -- HK0NA," Bob Allphin, K4UEE, recounts how 20 hams from six countries came together to activate the #12 most-wanted DXCC entity earlier this year. Travel with Paul S. Ewing, N6PSE, to Rotuma in his article "DXpedition to the Future," and with J. Robert Eshleman, W4DR, to Navassa in "DX Determination." Lots of hams depend on spotting networks to work DX. Murray Green, K3BEQ, tells how DX spotting networks have advanced from voice over 2 meter simplex to the Reverse Beacon Network in his article "The Evolution of DX Spotting." As many hams know, tubes can be expensive and hard to find. To overcome this, James Klitzing, W6PQL, developed a compact linear amplifier. In his article "Solid State 1 kW Linear Amplifier for 2 Meters," he shows readers exactly what they need to build the amplifier. Arch Doty, W7ACD, knows that there's more to cosmic and atmospheric noise than meets the ear. In his article "Those Mysterious Signals," he explains that while these signals may just sound like noise to us, they mean a lot more to radio astronomers. ARRL Education and Technology Program Coordinator Mark Spencer, WA8SME, shows how to control your VHF SSB transceiver to simulate full duplex operation in his article "Satellite CAT Interface for Working the Analog Birds." ARRL Test Engineer Bob Allison, WB1GCM, takes a look at the Alinco DJ-V57T handheld dual-band transceiver in this month's Product Review. He says the rig "offers a nice selection of basic features and good transmit and receive performance at a reasonable price. The standard battery pack is fine for casual use, but consider one of the optional high capacity packs if you expect to transmit frequently." ARRL Contributing Editor Rick Palm, K1CE, checked out the Kenwood TH-K20A handheld 2 meter FM transceiver, saying that it "is solidly built and easy to operate; it has a long battery life and great receiver performance." Of course, there are the usual columns you know and expect in the October QST: Happenings, Hints & Kinks, The Doctor Is In, Short Takes, Vintage Radio, How's DX and more. Look for your October issue in your mailbox. 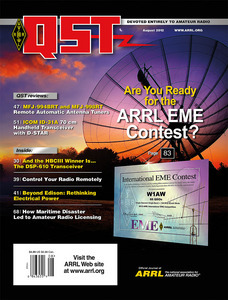 QST is the official journal of the ARRL, the national association for Amateur Radio. QST is just one of the many benefits of ARRL membership. To join, or to renew your ARRL membership, please see the ARRL web page. This feature is a concise monthly update of some of the things that the ARRL is doing on behalf of its members. This installment -- which covers the month of August -- takes a look at the upcoming Director and Vice Director elections, the 2012 sessions of the ARRL's Teachers Institute on Wireless Technology, the ARRL's perspective on the FCC's Congressionally mandated study on Amateur Radio, Field Day logs, changes for the upcoming November Sweepstakes, reports from the Official Observer Desk and more. Read more here. 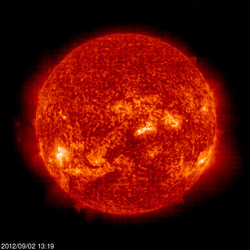 The Sun, as seen on Thursday, September 6, 2012, from NASA's SOHO Extreme Ultraviolet Imaging Telescope. This image was taken at 304 Angstrom; the bright material is at 60,000 to 80,000 Kelvin. Tad "I've seen sunny days that I thought would never end" Cook, K7RA, reports: There was a surprising jump in solar activity occurred this week: The average daily sunspot numbers rose nearly 55 points (that's almost 74 percent) to 128.7, while the average daily solar flux values were up more than 28 points to 136.9. A pair of coronal mass ejections (CMEs) on September 3 and 4 excited Earth's geomagnetic field, causing A index values to jump. The middle latitude A index on September 2-5 was 14, 23, 14 and 24, and the planetary A index on those dates was 12, 32, 13 and 28, while high-latitude college A index (Fairbanks, Alaska) was 48, 52, 39 and 49. Solar flux predictions show the flux values peaking on September 6-7 at 130, then on September 8-12 the solar flux lowers to 125, 120, 115, 110 and 105. Solar flux on September 13-16 is predicted at 100, then 95 on September 17-22, then 100, 110, 115, 120 and 125 on September 23-27, and then peaking at 130 on September 28. The planetary A index is predicted to be 10 and 8 on September 6-7, then 7 on September 8-10, 5 on September 11-13, 10 on September 14-16, 5 on September 17-19, 10 on September 20, 8 on September 21-23, and back down to 5 on September 24-28. Look for more on the ARRL website on Friday, September 7. For more information concerning radio propagation, visit the ARRL Technical Information Service Propagation page. This week's "Tad Cookism" is brought to you by James Taylor's Fire and Rain. The winner of the August QST Cover Plaque award is Bob Bruninga, WB4APR, for his article "Rethinking Electrical Power for the Ham." Congratulations Bob! The QST Cover Plaque award -- given to the author or authors of the best article in each issue -- is determined by a vote of ARRL members on the QST Cover Plaque Poll web page . Cast a ballot for your favorite article in the September issue today. 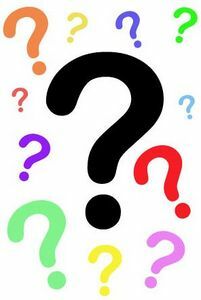 Will you be participating in the CW or Phone Sweepstakes contests in November? Are you "fluent" in any computer programming languages? Does your HF transceiver have a DSP noise reduction feature? Have you taken the new Amateur Extra (Element 4) exam that went into effect on July 1? Visit the QuickStats page and be sure to bookmark it in your browser. Results from this QuickStats poll will be published in the December 2012 issue of QST on the QuickStats page, located in the rear advertising section of the magazine. Along with monthly poll results, QST QuickStats offers colorful charts and graphs that highlight interesting Amateur Radio statistics.